Thanks for the link (and for pinning my favourite lucky cat charm on your Pinterst board). Happy to share info & luck! Hi , Do you know where I can find maneki neko in the Vancouver area? I live in Surrey just wondering if you know any good places other than the store in Metrotown. Preferable under $20.00. And if Daiso still sell them in Richmond. Sorry I live far so just seeing if you know any new places.. Thanks! I haven’t been to the Richmond Daiso in awhile, but I assume they still sell lucky cats. There may also be some other stores in the Aberdeen Mall that sell them. Also, Yokoyaya in downtown Vancouver, which is like a Daiso, sells them, as do other stores in Vancouver’s Chinatown area. do you know how i can purchase a lucky cat with both paws up? I live in Fort Worth Texas and can order from internet too. hi there- I’ve been looking for mini jade maneki neko for chokers or a large one for home luck- have you ever seen these? I’ve been scouring the internet trying to find them. You may be able to find inexpensive jade maneki neko charms in Chinatown (if you have a Chinatown near you), then remove the beads and use them how you like. Here’s one on Ebay (they may be less expensive in Chinatown stores): http://www.ebay.com/itm/Pink-Chinese-Knot-Handcrafted-With-Natural-Jade-Maneki-neko-Lucky-Cat-Charm-/281407817993?pt=LH_DefaultDomain_0&hash=item4185368909 (I haven’t found a source for the beads themselves, but if I do I will add it here). Hello guys. How are u? 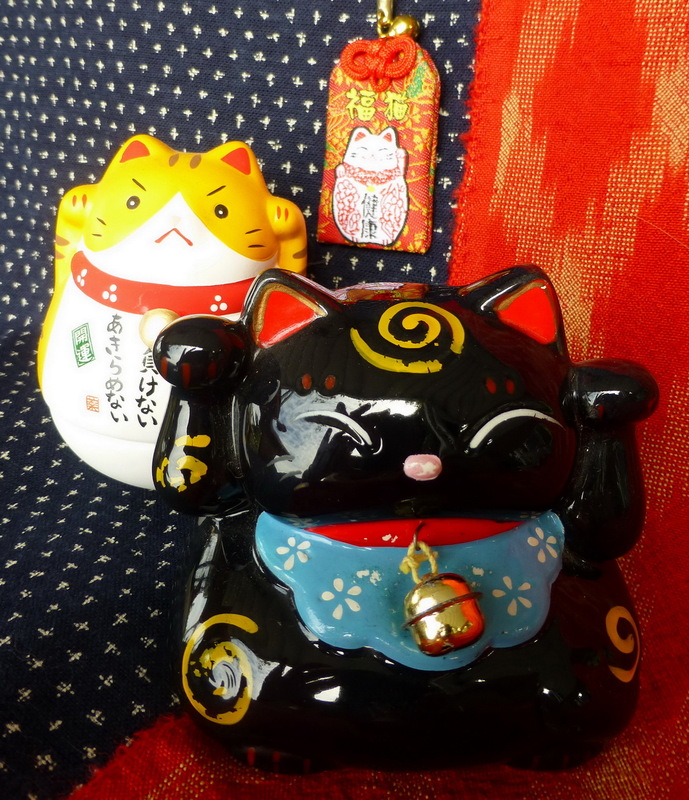 I’m doing a research about the manekineko and I find your web very interesting. So, I need to know who’s the person/ns who writes the articles in the web? That’s because I need to make the respective citations about it. Hi Carlos. Thank you for your interest in correctly crediting content on this site. Most of the posts are written by me. For these, you can cite the blog name: luckymanekineko.wordpress.com. If a post is written by someone else, the name is given at the top of the post. My husband and I are traveling to Japan in May and I have my heart set on bringing home a Lucky Cat. How difficult is it to find one in Tokyo? Do you have any suggestions of where to shop? I love the look of the ones in the photo in this post (non-tradional). Any advise would be great!! The yellow one was sold as part of a fund-raiser to help victims of the Tōhoku earthquake and tsunami in 2011 and doesn’t seem to be for sale any longer. I’m not planning to sell mine right now (though I may sell some of my lucky cats at some point in the future). This is for your facebook page (I’m not making an account on there because I don’t want them to know my personal details! ); a beckoning cat sign is shown in the intro for the Playstation1 game Wipeout 2097.